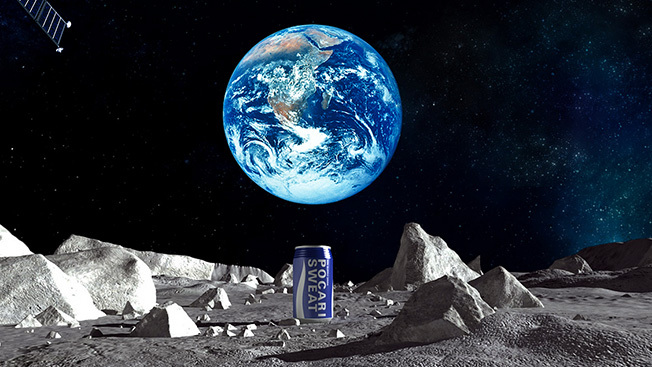 If someone told you the first brand on the moon would take the form of an aluminum can filled with energy-drink powder and the dreams of little children, you'd probably believe them—because it's the future, after all. What if that person was me, and I told you the can is actually a time capsule built to last 30 years on the moon's craggy surface—to be opened by future space explorers, and also to promote a beverage that they (or we) never knew existed? Japanese company Otsuka is doing just that. It's packaging a powered form (just add moon water) of its amazingly named beverage Pocari Sweat into just such a crafted vessel, along with the laser-inscribed dreams, and sending it to the moon in 2015 on the SpaceX-funded Falcon 9 rocket and Astrobotic Technology's "Griffin Lander." The can will be left on the moon's surface as a kind of mini billboard, or as the Verge calls it, "the first commercial product delivered to another world for marketing purposes."